Television habits consist of patterns of behavior determined by the amount of time and importance individuals give to watching television broadcasts and recorded videos and DVDs. Ever since the 1ate 1940s when television first became available, social scientists have been interested in its effect on behavior. Originally seen as entertainment for adults and older children, television in the twenty-first century is watched by all age groups, including infants. More than 98 percent of homes in the United States have at least one television set. Many have more. One study found that 32 percent of children ages two to seven had television sets in their bedroom. This number increased to 65 percent for children ages eight to 18. Factors that increase the likelihood of heavy television viewing by children include low socioeconomic status, living in a single parent household, and being born to a teenage mother. Viewing time is also increased by parental beliefs that television viewing does not hurt children and improves their vocabulary and imagination. Heavy parental television viewing, multiple television sets at home, television in the child's bedroom, and using television to distract young children all increase the likelihood that children will become heavy television and video watchers. Before the 1990s, few television programs were designed for children under the age of three. However, the success of programs such as "Teletubbies" aimed at children under age two, opened a new market to programmers. As of 2004, studies showed that by the age of 11 months, infants are watching a combined average of 75 minutes of television programming and videos daily. Between the ages of 12 and 23 months, this amount increases to almost two hours daily. In the first two years of life the brain develops rapidly, and children learn new physical, mental, and social skills. Infants need interaction with caregivers who respond to them and interact with them. Watching television is a passive activity that does not meet these needs. The AAP recommends that television and video viewing for children under age two be discouraged and severely limited. They suggest that reading, singing, playing, and interacting with adults fosters proper, age-appropriate brain development that can be inhibited by too much television watching. They recommend that televisions be removed from childcare areas, because they are a distraction to both caregivers and children. By the age of three, the average American child is watching more than two hours of television and videos daily. Toddlerhood is a time when motor skills develop and children begin actively moving and exploring their environment. Pediatricians are concerned that television time takes away from activities needed for physical and mental development. They recommend children of this age watch only a few selected programs or videos, after which the television should be turned off. Many educational programs such as "Sesame Street" are aimed at preschoolers. Properly selected and watched in moderation, these programs can increase reading readiness and number awareness and promote positive social behavior such as sharing and taking turns. However, preschoolers are highly influenced by advertisements on commercial television. Until the age of about eight, children lack the ability to differentiate between fantasy and reality both in programming and in advertising. In addition, a three-year study of television violence found that nearly 66 percent of television programs contain violence and that children's television programs contain the most violence of all programming. Preschool children are often frightened by what they see on television, including the news. American school-age children watch on average 4.5 hours of television a day. Repeated studies have shown that children who watch a lot of television perform more poorly in school. In addition, there is a definite link between television watching and childhood obesity. The link is strongest among African-American and Latino children. This link is thought to result from several causes. First, television viewing is a passive activity. Children who are watching are not actively playing or exercising. Second, there is a strong tendency to eat snacks while watching television, compounding the problem. Third, advertising is often aimed at promoting high calorie, less healthful foods. The eating habits of children who watch a lot of television are influenced by this advertising. School-age children are also influenced by the content of the programming they watch. Many studies have linked real-life violence to the repeated viewing of violence on television. Some experts theorize that children become immune to violence after seeing it repeatedly on television. For example, the average child will have seen over 8,000 television murders before finishing grade school. Other experts believe that because the hero uses violence to triumph as much as 80 percent of the time on television, children develop the idea that force is an acceptable way to solve problems. Finally, the aftermath of violence and the harm it does are rarely shown in a realistic way on television. Although television is not the only cause of social violence, most social scientists believe it is a significant contributing factor. Likewise, television's portrayal of sexual situations and the lack of on-screen consequences of sexual activity, the promotion of unrealistic body image, stereotypical gender roles, and under-representation of minorities have been found in multiple studies to promote unhealthy and unrealistic views among children and adolescents. The most common problems surrounding television viewing involve children being frightened by what they see, substituting television watching for health interactions with friends and family , and viewing material that is age-inappropriate. The most common parental concern surrounding television habits is controlling the amount and quality of television a child watches. Often parents who are heavy television viewers themselves see nothing wrong with turning on the television in the morning and letting it stay on all day. They may also be unwilling to give up watching their favorite programs, even when these programs are age-inappropriate for their children. This problem can be solved by taping programs for later viewing after children are asleep. The new television rating system and v-chip technology required by law in all televisions with a 13-inch screen or larger manufactured after 2000 is intended to help parents control what their children watch by allowing them to lock out certain programs. However, studies have shown that very few parents understand or use the television rating system in determining what their children may see and that very few actually use the v-chip technology to lock out specific programs. The American Academy of Pediatrics suggests the following steps to parents for controlling the television viewing habits of their children. Watch only specific programs; do not turn the television on and let it run. Remove televisions from children's bedrooms. Limit television viewing to two hours or less daily. Do not watch television during meals. Watch television with children and discuss what is shown. Substitute reading time or play time for television time. Teach children the difference between advertisements and program content. Limit television viewing to a maximum of two hours per day. Plan programs to watch by looking in the TV guide ahead of time. when there is nothing appropriate for children on television. Keep television sets out of children's rooms. Keep the television off during meals. Watch shows with your child, and discuss them afterward. and that not all advertised products are good or needed. on Media and the Family, 2002.
their child appears addicted to television and videos. Addiction may be suggested if watching television takes priority over schoolwork and family interactions and replaces normal social activities with friends. Parents should also be concerned if they feel their child is developing unrealistic expectations about body image from television or is excessively attracted to and talks about imitating violent, gory events on television or in the movies. American Academy of Pediatrics. "Children, Adolescents, and Television." Journal of Pediatrics 107, no. 2 (February 2001): 423–426. American Academy of Pediatrics, Committee on Public Education. "Media Violence." Journal of Pediatrics 108, no. 5 (November 2001): 1017–1025. 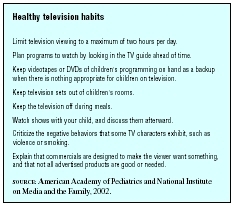 Robinson, Thomas N. "Television Viewing and Childhood Obesity." Pediatric Clinics of North America 48, no. 4 (August 2001): 855–78. Strasburber, Victor C. "Alcohol Advertising and Adolescents." Pediatric Clinics of North America 49, no. 2 (April 2002): 353–76. Villani, Susan. "Impact of Media on Children and Adolescents: A 10-Year Review of the Research." Journal of the American Academy of Child and Adolescent Psychiatry 10, no.4 (April 2001): 392–401. Yasgur, Batya S. "Parents See TV as Beneficial for Infants and Toddlers." Family Practice News (January 15, 2001). Available online at http://www.findarticles.com/p/articles/mi_m0BJI/is_2_31/ai_70649956 (accessed September 30, 2004).